The Erie Railroad (reporting mark ERIE) was a railroad that operated in the northeastern United States, originally connecting New York City — more specifically Jersey City, New Jersey, where Erie's former terminal, long demolished, used to stand — with Lake Erie. It expanded west to Chicago with its 1941 merger with the former Atlantic and Great Western Railroad, also known as the New York, Pennsylvania and Ohio Railroad (NYPANO RR). Its mainline route proved influential in the development and economic growth of the Southern Tier, including cities such as Binghamton, Elmira, and Hornell. The Erie Railroad repair shops were located in Hornell, and were Hornell's largest employer. Hornell was also where Erie's main line split into two routes, one north to Buffalo and the other west to Cleveland. On October 17, 1960, the Erie merged with the former rival Delaware, Lackawanna & Western Railroad to form the Erie Lackawanna Railroad. The Hornell repair shops were closed, and repair operations moved to the Lackawanna's Scranton facility; this had a devastating effect on Hornell from which it has never recovered. (The repair shops have subsequently been used, intermittently, for the assembly of railroad/transit equipment.) Much of the former Erie line between Hornell and Binghamton was damaged in 1972 by the floods of Hurricane Agnes, but the damage was quickly repaired and this line is today a key link in the Norfolk Southern Railway's Southern Tier main line. What was left of the Erie Lackawanna became part of Conrail in 1976. In 1983, Erie remnants became part of New Jersey Transit rail operations, including parts of its Main Line. Today, most of the surviving Erie Railroad routes are operated by the Norfolk Southern Railway. 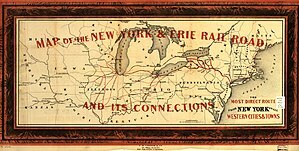 The New York and Erie Rail Road was chartered April 24, 1832 by Governor of New York, Enos T. Throop to connect the Hudson River at Piermont, north of New York City, west to Lake Erie at Dunkirk. On February 16, 1841 the railroad was authorized to cross into the northeast corner of Pennsylvania on the west side of the Delaware River. Construction began in 1836, and it opened from Piermont to Goshen on September 23, 1841. After some financial problems, construction resumed in August 1846, and the next section, to Port Jervis, opened on January 7, 1848. Further extensions opened to Binghamton December 27, 1848, Owego January 1, 1849, and the full length to Dunkirk May 19, 1851. At Dunkirk steamboats continued across Lake Erie to Detroit, Michigan. The line was built as 6 ft (1,829 mm) wide gauge; this was believed to be a superior technology to standard gauge, providing more stability. In 1848 the railroad built the Starrucca Viaduct, a stone railroad bridge over Starrucca Creek in Lanesboro, Pennsylvania which has survived and is still in use today. The viaduct is 1,040 feet (317 m) long, 100 feet (30.5 m) high and 25 feet (7.6 m) wide at the top. It is the oldest stone rail bridge in Pennsylvania still in use. The Erie's charter was amended April 8, 1845 to allow the building of the Newburgh Branch, running from the main line near Harriman north-northeast to Newburgh, also on the Hudson River. The branch opened January 8, 1850. It was later used as a connection to the New York and New England Railroad via a car float operation across the river to Beacon, New York. The Paterson and Ramapo Railroad and Union Railroad opened in 1848, providing a connection between the Erie at the village of Suffern in Ramapo and Jersey City, across the Hudson River from New York City. Through ticketing began in 1851, with a required change of cars at Ramapo due to the gauge break. In 1852 the Erie leased the two companies along with the Paterson and Hudson River Railroad, and Erie trains begin operating to the New Jersey Rail Road's Jersey City terminal on November 1853 after a third rail for wide gauge was finished. In 1852 the Buffalo and Rochester Railroad, part of the New York Central Railroad system, completed a new alignment between Buffalo and Batavia. The alignment from Buffalo to Attica was sold to the Erie's Buffalo and New York City Railroad, a reorganization of the Attica and Hornellsville Railroad, and converted to the Erie's wide gauge. The extension from Attica southeast to Hornellsville opened on November 17, 1852, giving the Erie access to Buffalo, a better terminal than Dunkirk. The Erie began operating the Chemung Railroad in 1850; this provided a branch from Horseheads north to Watkins. The Canandaigua and Elmira Railroad opened in 1851 as a northern extension from Watkins to Canandaigua and was operated by the Erie until 1853. At this point, the Erie subleased the Chemung Railroad to the Canandaigua and Elmira. The C&E went bankrupt in 1857 and was reorganized in 1859 as the Elmira, Canandaigua and Niagara Falls Railroad, at which time the Erie leased it again. The Chemung Railroad reverted to the Erie in 1858 during the bankruptcy. The Canandaigua and Niagara Falls Railroad continued this line beyond Canandaigua to North Tonawanda with trackage rights over the Buffalo and Niagara Falls Railroad to Niagara Falls and the Niagara Falls Suspension Bridge into Ontario. This was leased by the Canandaigua and Elmira from its opening in 1853 to 1858, when it went bankrupt, was reorganized as the Niagara Bridge and Canandaigua Railroad, and was leased by New York Central Railroad. The NYC converted it to standard gauge and blocked the Erie from it. The Erie pushed southward into the coal fields of Elk County, Pennsylvania, Jefferson County, Pennsylvania, and Clearfield County, Pennsylvania to acquire a source of fuel for its locomotives. This action began with the February 26, 1859 merger of two earlier roads to form the Buffalo, Bradford and Pittsburgh Railroad Company. The new organization was sponsored by the New York and Erie Railroad Company, later known as the Erie. 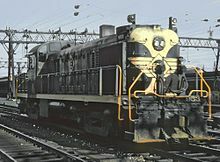 The B.B.& P. ran for 25.97 miles through Bradford, Pennsylvania after connecting with the primary line of the Erie at Carrollton, New York. The line came to a point known as Gilesville, the site of a bituminous mine, by January 1, 1866. In August 1859, the company went into receivership due to the large costs of building, and on June 25, 1861 it was reorganized as the Erie Railway. This was the first bankruptcy of a major trunk line in the U.S. In 1863, the Erie leased the Buffalo, New York and Erie Railroad and its subsidiary the Rochester and Genesee Valley Railroad, jointly operating it with the Pennsylvania Railroad's Northern Central Railway. The BNY&E had taken over the Buffalo and New York City Railroad in 1857 due to the Erie's bankruptcy, and the BNY&E used it west of Attica to reach Buffalo from its southeast end at Corning. The R&GV split from the main line at Avon, running north to Rochester. A joint through line was created between Philadelphia and Buffalo. At this time, the Northern Central leased the Elmira and Williamsport Railroad, forming the part of the line from Elmira south into Pennsylvania. After disputes due to charges of the Erie using its own line via Hornellsville (the B&NYC) too much, and problems with the gauge break at Elmira, this contract was cancelled in 1866. The Elmira, Jefferson and Canandaigua Railroad (and its Chemung Railroad) was transferred to the Northern Central, and a third rail was built to allow the Northern Central's 4 ft 8 1⁄2 in (1,435 mm) standard gauge trains to operate over it. To restore access to the Niagara Falls Suspension Bridge, the Erie got the Suspension Bridge and Erie Junction Railroad chartered in 1868. The line opened in 1871, running from eastern Buffalo to Tonawanda and then alongside the New York Central Railroad's Buffalo and Niagara Falls Railroad to the bridge. The Erie International Railway, chartered 1872 and opened 1874, provided a branch to the International Bridge, and the Lockport and Buffalo Railway, chartered 1871 and opened 1879, provided a branch to Lockport. In the Erie War of the 1860s, four well-known financiers struggled for control of the company; Cornelius Vanderbilt versus Daniel Drew, James Fisk and Jay Gould. Gould ultimately triumphed in this struggle, but was forced to relinquish control in 1872–73, due to unfavourable public opinion following his involvement in the 1869 gold-rigging scandal and to his loss of $1 million of Erie Railroad stock to the British con-man Lord Gordon-Gordon. In 1869, the railroad moved its main shops facilities from Dunkirk to Buffalo. Rather than demolishing the shops in Dunkirk, the facility was leased to Horatio G. Brooks, the former chief engineer of the NY&E who was at the controls of the first train into Dunkirk in 1851. Horatio Brooks used the facilities to begin Brooks Locomotive Works, which remained in independent business until 1901 when it was merged with seven other locomotive manufacturing firms to create ALCO. ALCO continued new locomotive production at this facility until 1934, then closed the plant completely in 1962. The Erie still did not see profits and via bankruptcy was sold in 1878 to become the New York, Lake Erie and Western Railroad. The New York, Lake Erie, and Western Coal and Railroad Company pushed the line south to Johnsonburg, Pennsylvania in 1881 - 1882, a distance of 29.68 miles (47.77 km). This section encompassed the once significant Kinzua Bridge. In 1883 the Erie expanded west beyond New York State when it leased the New York, Pennsylvania and Ohio Railroad which ran westward from Salamanca. Eventually, the Erie would reach as far west as Chicago. In 1886, it was reported that the Erie and the Reading Railroad shared ferry services between their two Jersey City terminals, the larger being Pavonia Terminal, and Fulton Ferry in Brooklyn, New York for 11 round trips on weekdays and Saturdays, and four round trips on Sunday. In 1889, it opened a new bridge across the Hackensack River improving service to its terminals. By 1893, the New York, Lake Erie and Western Railroad went into bankruptcy reorganization again and emerged in 1895 as the Erie Railroad. In 1897, trackage rights were obtained by the Erie over the Pennsylvania Railroad, from Johnsonburg to Brockway, Pennsylvania, then known as Brockwayville. The distance was 27.76 miles. On May 1, 1907 the Erie obtained new trackage rights over the Buffalo, Rochester, and Pittsburgh Railway from Clarion, Pennsylvania, north of Johnsonburg to Eleanora Junction (later called Cramer) in Jefferson County, Pennsylvania. This covered a distance of 50.67 miles. George W. Perkins brought Frederick D. Underwood into the Erie Railroad in 1910. During the eastern railroad strike of 1913 Underwood agreed to accept any ruling made by mediators under the Newlands Reclamation Act. One of the demands made by Erie employees was a 20% increase in wages. Erie management had refused a wage increase but compromised by asking employees to wait until January 1915 for any advance. Union leaders agreed to make this an issue which Erie management would settle with its own men. However, W.G. 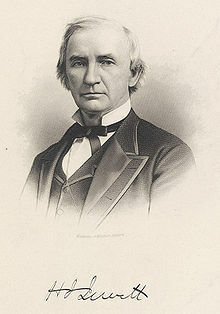 Lee, president of the brotherhood of railroad trainmen, asserted that the only way "to deal with the Erie is through J.P. Morgan & Company, or the banks". Underwood responded from his home in Wauwatosa, Wisconsin, saying "I am running the Erie Railroad: not George W. Perkins, nor J.P. Morgan & Co., nor anybody else." In mid-1920s the successful Van Sweringen brothers gained control of the Erie, improving operations (such as standardizing the railroad's locomotives and rolling stock) and bottom-line earnings. Unfortunately, both brothers—who at the time owned several other railroads—died at an early age but had they lived the shape of railroads in the east would likely look very different today. Despite the revages of the Great Depression, the Erie managed to hold its own until it entered bankruptcy on January 18, 1938. Its reorganization, accomplished by December 1941, included the purchase of the leased Cleveland and Mahoning Valley Railroad, swapping high rent for lower interest payments, and the purchase of formerly subsidized and leased lines. The reorganization paid off, as the Erie managed to pay dividends to its shareholders after the dust had settled. In 1938, the Erie Railroad was involved in the famous U.S. Supreme Court case of Erie R.R. v. Tompkins. The Erie doctrine, which governs the application of state law in federal diversity cases, is still taught in American law schools today. On September 15, 1948, the Cleveland Union Terminal Company allowed the Erie to use the Union Terminal adjacent to Terminal Tower in lieu of its old station. Steam last operated on the Erie on March 17, 1954, when the fires were dropped on K-1 class Pacific locomotive No. 2530, used on a commuter run between Jersey City and Spring Valley, New York. Revenue freight traffic, in millions of net ton-miles. The Erie prospered throughout the mid-1950s, but then began an irreversible decline. The company's 1957 income was half of that in 1956; by 1958 and 1959, the Erie posted deficits. 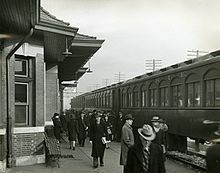 Passenger service, in steep decline, ended in 1959. The business recession that occurred in the 1950s led the Erie to explore the idea of doing business with the nearby Delaware, Lackawanna and Western Railroad (DL&W). The first result of this was the abandonment of duplicate freight facilities in Binghamton and Elmira, New York. Between 1956 and 1957, the Erie shifted its passenger trains from its former Jersey City terminal to the DL&W's newer Hoboken Terminal. Also, the DL&W's main line between Binghamton and Elmira was abandoned in favor of the Erie's parallel main line in 1958. These successful business consolidations led to merger talks (which, at first, also included the Delaware and Hudson Railroad); on October 17, 1960, the two railroads merged to create the Erie Lackawanna Railroad. Erie's large repair facility in Hornell closed — an economic impact from which the city has never recovered — and operations were consolidated at the Lackawanna's Scranton facility. Year-end mileage operated, including C&E but not NYS&W/WB&E: 2451 route-miles, 6013 track-miles in 1925; 2320 route-miles, 5395 track-miles in 1956. NJ&NY adds 46 route-miles in 1925, 39 in 1956. The former Erie tracks between Hornell and Binghamton were destroyed in 1972 by Hurricane Agnes. In addition to its steam and diesel services the Erie also operated an electric commuter rail line to its terminal station in Rochester, New York. 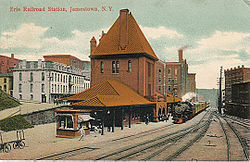 The station was one of the Erie's few electrified railroad stations, and the railroad became one the first to provide electric commuter services in 1907. Hugh J. Jewett, President 1874–1884. As part of the 30th anniversary of Norfolk Southern Railway being formed, NS decided to paint 20 new locomotives into the paint scheme of predecessor railroads. NS #1068, an EMD SD70ACe, was painted into Erie Railroad's green passenger scheme. It was released on May 25, 2012. ^ Totals include Chicago & Erie and NJ&NY, but not NYS&W/WB&E or L&WV. Total for 1960 is Erie through 16 October and then Erie-Lackawanna. ^ a b c d Drury, George H. (1994). The Historical Guide to North American Railroads: Histories, Figures, and Features of more than 160 Railroads Abandoned or Merged since 1930. Waukesha, Wisconsin: Kalmbach Publishing. pp. 129–135. ISBN 0-89024-072-8. ^ a b c "The Erie Railroad". The Clearfield Progress. November 16, 1967. p. 1. ^ "Rochester and Genesee Valley Railroad". Archived from the original on February 9, 2012. ^ "Erie and Brooklyn Annex". Brooklyn Eagle Newspaper. January 3, 1886. p. 13 – via Newspapers.com. ^ "The Erie's New Bridge. ; The Draw At The Hackensack River Safely In Position" (PDF). The New York Times. November 18, 1889. ^ "Erie Road Agrees to Accept Ruling of Mediators". Lincoln, Nebraska Daily News. July 23, 1913. p. 6 – via Newspapers.com. ^ "PRR Chronology, 1948" (PDF). The Pennsylvania Railroad Technical & Historical Society. September 2004. Archived from the original (PDF) on September 29, 2007. ^ Ball, Don, Jr. America's Colorful Railroads (Bonanza 1979 ed.). Bonanza Books, a division of Crown Publisher's, Inc. p. 53. ISBN 0-517-30488-0. LCCN 79-54682. ^ Schafer, Mike (2000). More Classic American Railroads. Osceola, WI: MBI Publishing Co. ISBN 978-0-7603-0758-8. OCLC 44089438. ^ Lawrence, Scot (October 25, 2006). "Railroad History of Rochester, New York". Scot's Train Pages. Rochester, New York. Archived from the original on March 24, 2012. Retrieved September 14, 2011. ^ "Rochester-Mount Morris Electrification". Don Ross Group: Don's Rail Photos. ^ Brown, Randolph R.; McCourt, John P.; Obed, Martin E. (2007). "Erie's Heavyweight Steel RPOs: 1927 Through Retirement". The Diamond. 21 (1): 4–5. Meyer, B.H. ; MacGill, Caroline E. (1917). History of Transportation in the United States before 1860 (PDF). pp. 366–72. Mott, Edward Harold (1908). Between the Ocean and the Lakes: The Story of Erie. New York: Ticker Publishing Co., 1908. Reynolds, William; Gifford, Peter K.; Ilisevich, Robert D. (2002). European Capital, British Iron, and an American Dream: The Story of the Atlantic & Great Western Railroad. The University of Akron Press. Daniel C. McCallum, "Superintendent's report: 1856" in Shafritz, Jay; et al., eds. (2015). Classics of Organization Theory. Cengage Learning. pp. 47–48. ; another copy in Chandler, Alfred D., Jr. (ed.). The Railroads: The Nation's First Big Business. Wikimedia Commons has media related to Erie Railroad. Historic American Engineering Record (HAER) No. NY-124, "Erie Railway, New Jersey, New York, Pennsylvania"
This page was last edited on 2 March 2019, at 00:00 (UTC).